If 1997’s GoldenEye 007 for Nintendo 64 had you scouring its rich landscapes for power weapons, hidden passages, and ready-to-explode wooden chairs, there are a few secrets you might have missed during your 00 service. 1. IT WAS ORIGINALLY GOING TO BE RELEASED FOR SUPER NINTENDO. Developed by British game house Rare Ltd., the game was first proposed as a 2-D side-scroller for the Super Nintendo Entertainment System, but GoldenEye 007 director Martin Hollis suggested making it a “3D shooting game” for Nintendo’s under-development console—code-named “Ultra 64”—instead. 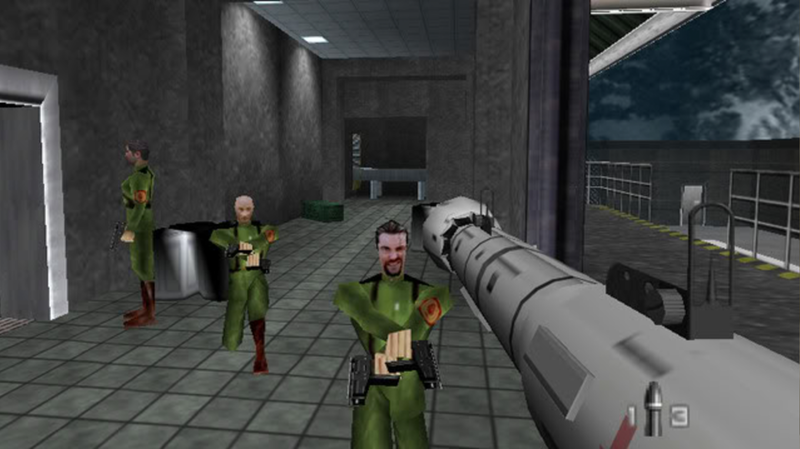 Developers then considered making it an on-rail shooter similar to Virtua Cop, but ultimately decided to give Bond free rein to explore each level. 2. IN GERMANY, IT’S ILLEGAL TO ADVERTISE THE GAME OR SELL IT TO MINORS. In the 1980s, the German federal agency Bundesprüfstelle für jugendgefährdende Medien (Federal Department for Media Harmful to Young Persons) began adding video games to its index of media found to be harmful to young persons. The index itself cannot legally be printed as a list, and its contents are illegal to advertise in Germany. In April 1998, GoldenEye 007 was added to the index because of its death scenes and perceived glorification of violence. There are reportedly around 400 games on the list today. 3. GOLDENEYE 007’S MULTIPLAYER MODE WAS A LAST-MINUTE ADDITION. Around a month before the game’s scheduled release, programmers decided to include the multiplayer feature as an afterthought, and spent the remaining few weeks building it. The eleventh-hour change turned out to be a brilliant one—the multiplayer mode was among the game’s most popular and innovative features. 4. THE GAME REFERENCES ALL PRIOR BOND MOVIES, AND STAR TREK, TOO. In the “Streets” stage of the game, a Star Trek reference plays a key role—the very vulnerable civilians are wearing token red shirts, marking them for trouble. 5. EVERY CHARACTER PLAYS WITH BOND’S HANDS. While the single-player and multiplayer modes include a range of male and female characters (some of them wearing gloves) from GoldenEye and other Bond films, the hands visible from every player’s first-person perspective are always James Bond’s, regardless of character choice. 6. GOLDENEYE 007’S SIGNATURE “DEATH FALL” IS IN EVERY BOND GAME. At least some version of the death animation known as the "GoldenEye fall"—in which a mortally wounded character drops to their knees before falling flat—has been included in every James Bond game made since. Of course, the original game includes other falling styles, too. 7. THE SOLDIERS AND HENCHMEN ARE ACTUALLY RARE STAFF. The faces of the game’s nameless enemies were created to resemble those of its developers. Those enemies also have a total of thirty different animation routines, depending on how they’re hit, for being blown up or shot. 8. DEVELOPERS REALLY USED THE MOVIE’S SETS. While the game was released two years after GoldenEye, the Rare team visited the film’s sets during GoldenEye 007’s early development period. The designers took pictures and were given blueprints to help them develop authentic (though often expanded) levels. 9. THE NAME "GOLDENEYE" REFERENCES IAN FLEMING’S OWN COVERT OPS. Though the film’s script was completely original, the name "GoldenEye" paid homage to Bond creator Ian Fleming, who worked on a contingency plan for a Nazi invasion of Spain—code name “Goldeneye”—while serving as a lieutenant commander for British Naval Intelligence during the Spanish Civil War. Fleming later gave the name to his estate in Oracabessa, Jamaica where he wrote many Bond novels. Fleming also credited the name to the 1941 novel Reflections in a Golden Eye by Carson McCullers, and—despite the suspicion of many—always maintained that 007’s adventures were not based on his own. 10. A COPY OF THE FILM GOLDENEYE IS HIDDEN IS THE GAME. In the “Bunker 2” stage, one of Bond’s objectives is to collect a CCTV tape. That tape is, in fact, a copy of the film GoldenEye (the cover of which can be seen by viewing Bond’s inventory). 11. IT WAS AMONG THE FIRST GAMES TO MAKE PLAYERS EARN BUILT-IN CHEATS. In addition to the single player and multiplayer modes, GoldenEye 007 has a cheat option mode that opens up both beneficial and novelty conditions for play. The cheats are initially unavailable and must be unlocked by completing certain skill-based tasks within the game. For example, to unlock DK mode (making all characters have huge heads, tiny bodies, and massive arms like Nintendo’s Donkey Kong), a player needs to complete the “Runway” stage on the Agent difficulty level in 5 minutes, while unlocking Tiny Bond (making Bond less than half his usual size, and harder to shoot) requires completion of “Surface 2” on 00 Agent in 4:15 or less. 12. THE GAME HAS A “SPIRITUAL” SEQUEL. While Rare handed off the licensing for the Bond series after this release, the company also produced Perfect Dark, considered to be GoldenEye 007’s “spiritual successor,” with much of the same gameplay and features. 13. GOLDENEYE 007 WAS ONE OF THE MOST POPULAR N64 GAMES OF ALL TIME. It was the third-best selling Nintendo 64 game ever with 8 million copies sold (losing out to Super Mario 64 and Mario Kart), and grossed $250 million worldwide. 14. IT’S ONE OF THE SMITHSONIAN’S FAVORITES. The Smithsonian Institution’s 2012 exhibit “The Art of Video Games” explored the “forty-year evolution of video games as an artistic medium,” and selected 80 key games with the public’s help. GoldenEye 007 was voted the “most pivotal” of N64 target games because of its many innovative qualities and striking visuals, but it had to surrender its spot in the exhibit to Star Fox due to copyright issues with the film’s license. 15. FOR THE FIRST-PERSON SHOOTER GENRE, IT WAS A TOTAL GAME-CHANGER. According to Gamasutra, the game also “proved that it was possible to create a fun FPS experience on a console, in both single-player and deathmatch game modes.” Because the new N64 controllers allowed for more agility, first-person characters no longer made it through levels by being seemingly bulletproof, but could rather use stealth tactics such as running, walking, crouching, hiding, climbing, jumping, creeping, and zooming in on certain features.